HELP OTHERS SUCCEED AND AT THE SAME TIME HELP YOURSELF FROM FEELING UNDERAPPRECIATED! 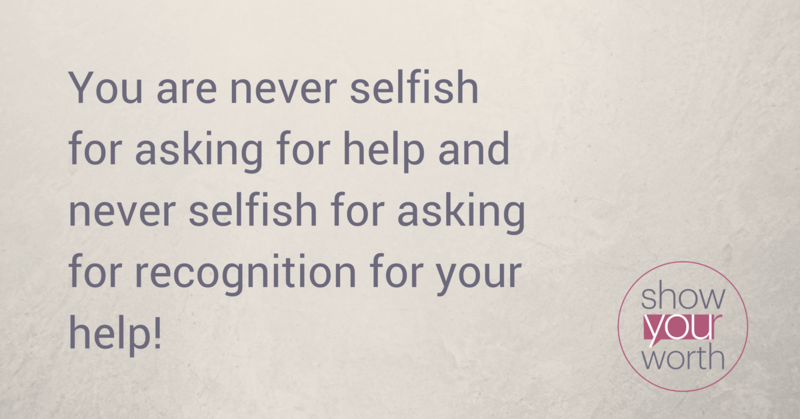 So why is it that sometimes you feel unappreciated and deflated from helping and giving? I have a client who is helping a friend with a business startup. My client is a seasoned professional who for a living helps startups succeed. When her friend asked if she would help her with her new adventure, my client did not hesitate to say yes. Am I in the wrong for feeling this way? Am I jealous of my friend’s success? Am I selfish about this? Am I after all, not a very nice person? Clearly, she is spending a lot of time beating herself up mentally. We started working together on figuring out why she feels this resentment. We found that my client’s friend does praise and appreciate my client for her ideas, help and time, but only when they are just the two of them. As for publicly appreciating my client’s work, no credit has ever been given. The friend has never shared credit in their mutual circle of friends, never officially mentioned her when interviewed, and never has she asked my client how she can help her. It became clear that my client has not been aware of what her needs were and not communicated those needs to her friend. When something doesn’t turn out as we expect or it starts to feel uncomfortable or not fulfilling, the easy thing to do is to walk away. But when helping, after all, gives us so much pleasure the ‘walk-away’ approach is not a smart solution. Most likely if you walk away from one situation without dealing with it, you might reencounter this situation. Instead of her walking away we started to work on how to add a layer to the giving. Not limiting giving, not how to say ‘no,’ but to add a positive way to get clarity and communicate. 1) What do I require from giving to feel fulfilled? 2) What do I need to ask for in return to feel appreciated? 3) If I do not feel fulfilled and appreciated, when and how will I communicate this? 1) Why you are giving. 2) What you can expect to receive in return. 3) How long you will contribute and in what ways. Instead of beating yourself up for feeling resentment towards the person you are helping, you can turn this around by being clear from the beginning on what your giving is worth to you and what you expect to receive back. If you are on the receiving end, remember to ask what you can do in return. You might hear ‘nothing,’ but then you have asked and shown you are willing to give as well. Lena Beck Rørvig is a seasoned executive coach and leadership development consultant. She is working with executives from aspiring managers to board level, across industries worldwide. She has created the ‘Show Your Worth’® program that leverages development for companies’ female employees through a sustainable expert program. The program directly identifies the challenges women face when wanting to step up and advance their careers, resulting in a transformational, positive impact for everyone involved in the process. Workshops, online programs, coaching and speaking.